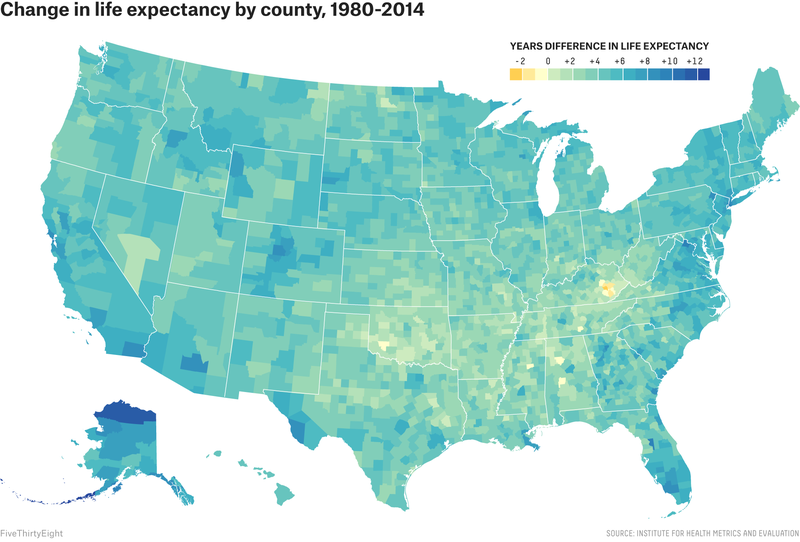 Your life expectancy can vary by as much as 20 years depending on which county in the U.S. you live in. That’s according to new research published Monday in the journal JAMA Internal Medicine. Life expectancy for the country as a whole grew by more than five years from 1980 to 2014, to an average of 79.1 years. During that time, however, some areas saw increases of more than 13 years, while a few others saw declines of up to 2.3 years. This new study adds to a growing body of research showing that race, education, wealth and where you live can help determine how long you will live. A series of papers published over the last couple of years showed a disturbing increase in mortality among white people without a college degree. In the wake of the divisive presidential election, that work drew grim headlines about the death of middle-aged whites. Some argued in response that the focus on whites was misplaced, given that mortality rates for black people and Native Americans are higher than those of other racial groups. But combining these socioeconomic and racial disparities with the variation in geographical outcomes paints a harrowing picture of a stark U.S. reality: The wealthiest country on earth, which also spends the most money on care for the sick, has far from the best health outcomes. 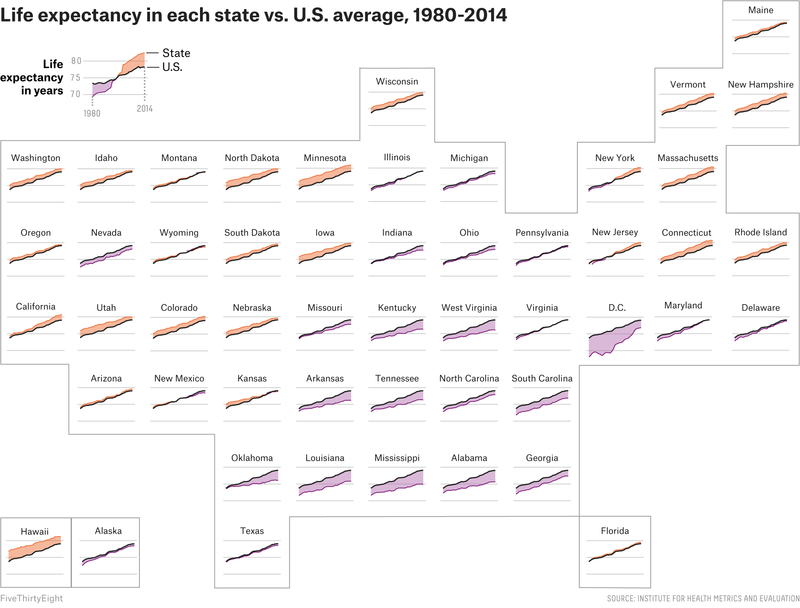 Life expectancy at birth1 — how long a newborn can be expected to live if current mortality patterns remain constant — has risen in every state since 1980, according to the analysis, which was done by researchers from the Institute for Health Metrics and Evaluation at the University of Washington. But state snapshots smooth out more localized health trends, according to the study. In Kentucky, for example, average life expectancy increased from 72.9 to 76.3 years over the 35-year span the authors studied. 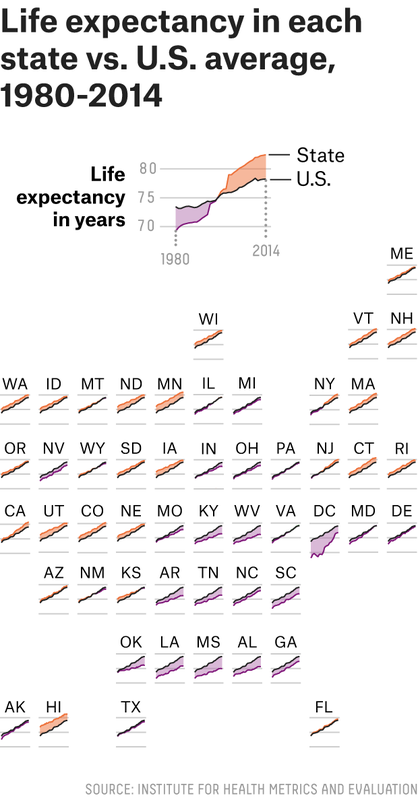 But in the eastern part of the state, in the heart of Appalachia, life expectancy decreased. Babies born in eastern Kentucky, along the Mississippi Delta and on Native American reservations in the Dakotas have the lowest life expectancies in the country. If current health trends continue, they aren’t expected to live much beyond an average of 70 years. Meanwhile, a baby born along the wealthy coast of California can be expected to live as long as 85 years, the authors found. 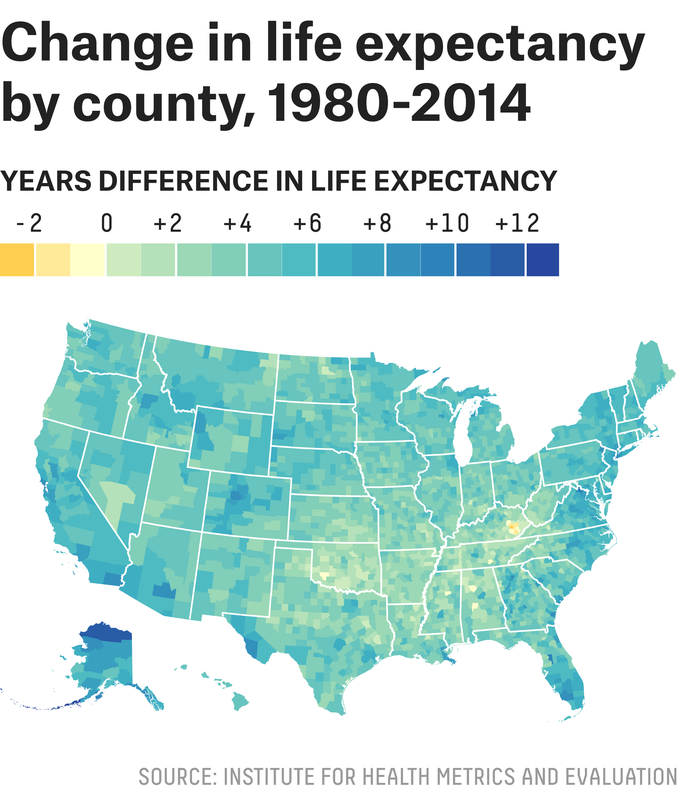 Some of the outcomes reflect longstanding issues: There has been a slight improvement in health along the Mississippi Delta, for example, but life expectancy there was so much lower than average three decades ago that children in the region have not caught up — they are still expected to live shorter lives than those born nearly anywhere else in the country. In southern Oklahoma, where parents could previously expect their children to live as long as the national average, stagnant regional health outcomes amid national improvements mean kids there now are expected to live three years less than their peers. The study also highlights recent improvements in some areas: The mountains of western Colorado, which attract a wealthy, active group to their ski resorts, saw some of the largest increases in life expectancy in the country, adding seven to 13 years since 1980. Just as geographical variations are masked by national averages, life expectancy can also obscure important variations in how old people are when they die. The researchers looked at the risk of mortality across age groups over time and found less geographical variation in mortality among children and adolescents than there was 35 years ago. Among older adults, however, geographical inequalities in mortality have increased. A look at what might be causing the differences in life expectancy at birth showed that race and economics appear to explain much of the disparity, largely because these factors are linked to differences in negative health behaviors or outcomes. Smoking, obesity, hypertension and access to health care, combined with race and economics, explained nearly three-quarters of these disparities, according to the authors. Combined with earlier research exploring geographical variations in mortality, the study provides a powerful road map for policymakers looking to address health disparities in the U.S.
Life expectancy at birth is calculated using life tables, which use estimates of age-specific mortality rates (the percentage of people from different age groups who die each year) to calculate life expectancy. It reflects how long a newborn can expect to live given current mortality trends.